Read Sri Lanka Government’s gazette in Sinhala & Tamil. 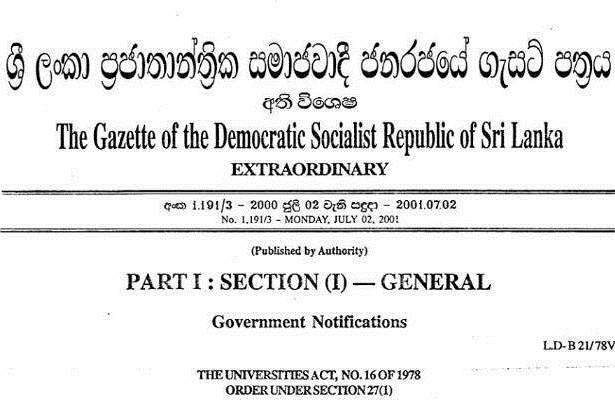 Now you can read Sri Lanka Government’s gazette Online free. GAZETTES are published on every Friday. Gazette Sinhala version is issued free with Dinamina newspaper every Friday. Gazette Tamil version is issued free with Thinakaran newspaper every Friday. SECTION(I) for proclamations, appointments etc. ජේ.වී.පී එකෙන් අයින් වෙලා 'ශ්‍රී ලOකා ශිෂ්‍ය බල සන්දානය' කියල අලුත් පක්ෂයකින් චන්දෙ ඉල්ලන්න වැඩ පිළිවෙළක් හැදුවොත් ශිෂ්‍ය ප්‍රජාවට මීට වඩා දෙයක් කරන්න පුලුවන් වෙයි. Your are exactly correct daughter. I remember the so called JVP activities in UOM during my period in 1970's. It was horrible and your suggestion supposed to be a marvelous. Remember it should only be for students mainly.